More details about the U42 camera can be found here. The most direct way to test for CCD non-linearity iis to measure the intensity of a stable lamp (for example beta light or stabilized LED) as a function of exposure time and then plot level per unit time versus level. For linear camera, this plot should be constant. Deviation from the constant value is a measure of the non-linearity. We have measured the linearity of the Apogee ALTA U42 CCD camera in this way. We use the so called Bracketed Exposure method which involves making images with varying exposure time which are bracketed with images with constant exposure time. For instance, in a sequence 5s, 2s, 5s, 7s, 5s, 10s, 5s, 13s, 5s, 17s, 5s, 20s, the images with increasing exposure time are bracketed with 5s exposures. The constant exposures (5s in this example) are used to check and, if exist, to calibrate the variation of the lamp intensity (lamp drift). Figure bellow shows the equipment we used for the linearity test. Left panel of the figure shows the schema of the device (taken from Berry and Burnell, 2000). Basically, it is a light-box (made from heavy cardboard or light plywood) which consist of a faint source of light on the left (circuitstabilized LED in their case) and CCD camera on the right side of the box. They put two light diffusers into the device - one in front of the camera and the other after the light source (they recommend using an opal-glass or milk plastic as a diffuser). The light-source intensity is varied by changing several slides (made also from heavy cardboard or light plywood) with drilled holes of different size. The light baffle in the middle of the device serves to reduce the scattered light from its inner wall. Right panel of the figure shows our improvised device. The light-box is actually the adapter for the 60cm telescope in our case. The camera and the light source are attached to the adapter on the right and left side of the adapter following the schema. We used semi-transparent paper as a light-diffuser. Figure below is the result of the test. Panel on the left, shows the light level (corrected for lamp drift) versus exposure time. Solid line is a linear fit to data with counts bellow 30 000 ADU where we assume that our camera is linear (coefficients of the linear fits are given in the legend). Therefore, the values returned by the linear fit are the expected values, that is, the light level that we expect to measure if the camera would be linear. Panel on the right shows the difference between measured and expected light level (in percentage) as a function of light level. (v) according to the linear fit on Fig.5, the time coordinate intercept -0.1s. This means that a time correction of 0.1s should be added to the selected exposure time. This is especially important when observing stars that require very short exposure times. For example, a 1s exposure on such a star would really be exposed 1.1s making the star 0.1 magnitude brighter when compared with stars in longer exposures. More details about the E47+ camera can be found here. More details about the ST-10ME camera can be found here. The AO-7 adaptive optic has been specifically designed to enable an ST-7/8/9/10/2000 camera user to obtain the ultimate in image resolution that a telescope and site can achieve. 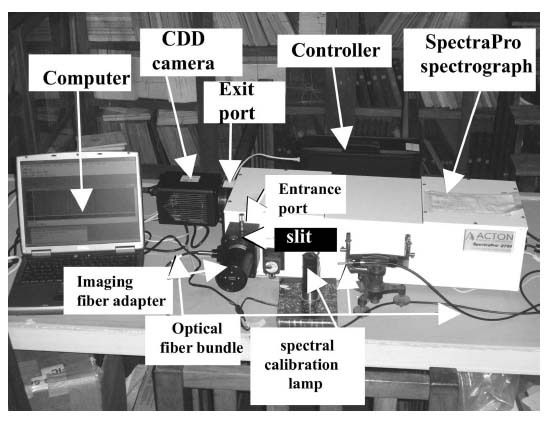 Figure below shows the AO-7 adaptive optic attached to the ST-10ME CCD camera (Credits: Vince Oliver). 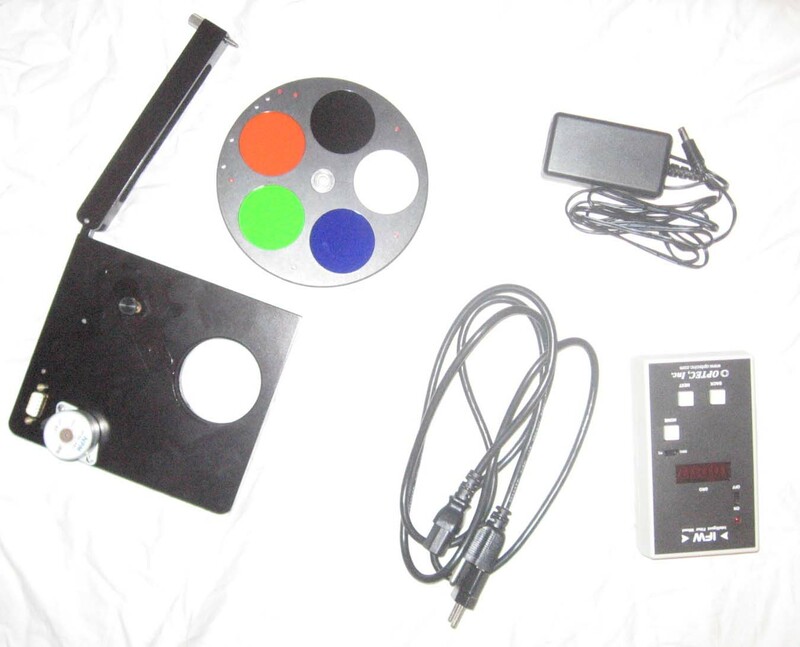 IFW is used for photometry in combination with the Apogee cameras. Figure below shows the main components of the IFW. Filter-wheel contains BESSEL U, B, V, R and I filters (Credits: Vince Oliver).